Don’t worry! You can be fixed! There are plenty of scary things on the internet about aesthetic injectables gone wrong, and although I hate to add fuel to that fire (because majority of the time the result is amazing! ), I had a client come see me over the holidays who was having one of such situations (not from me!). She allowed her pictures to be used, so should someone else experience a similar situation, they would hopefully find her story! Remember, no one is every perfect, and filler is meant to improve your natural beauty. I have had many people contact me about tear troughs. Belotero is a game changer for this area, and I LOVE the results from it. I am very experienced with this area and this product. If you are seeking tear trough augmentation, make sure you seek out someone who specializes in it! Because Photoshop doesn’t work in person… only on the internet! Want a good photographer? Everyone should have one! Check out one of my favorite fashion photographers, Alyssa Silvestri. More info on Belotero? Check out my previous blogs! Video Blog: Tear Trough Augmentation. The 40-52 year-old age group continues to be the majority of Botox recipients, but injections continue to become increasingly popular amongst younger clients (ASPS 2013 Plastic Surgery Statistics Report). It’s Never too Soon to Start Botox! One in four women over the age of 30 is interested in learning more about Botox injections. It is around this age we start to really notice fine lines on our faces. 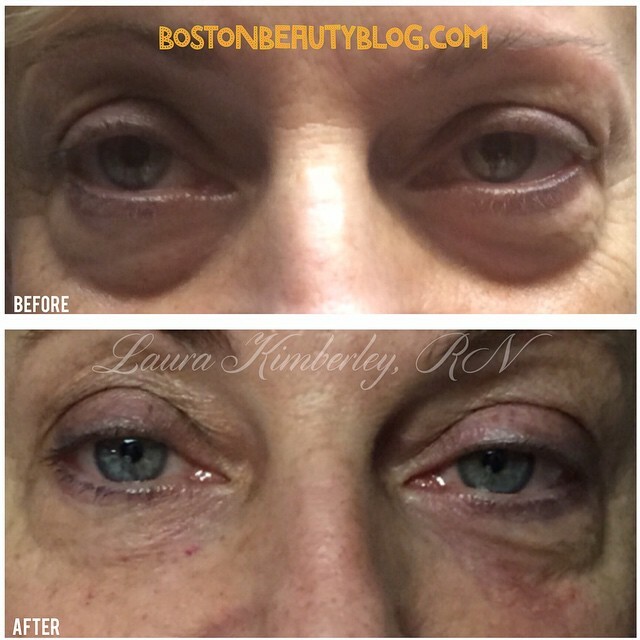 It is actually better to start treating the fine lines of the face at a younger age, preventing the fine lines from becoming deeply etched “railroad tracks,” as one patient of mine in her early 30’s, L.M., so lovingly called her forehead. There is no specific age that is “perfect;” it’s never too late to start, and so long as you’re over the age of 18 and you have wrinkles forming at rest, you are a candidate for Botox injections. I have a few clients in their lower 20’s with the skin of a 40 year old. The scale we use to determine the age your skin looks is called the Glogau Scale. Being preventative is always the best approach to your health. SUNBLOCK is your first line of defense! But if you feel like your skin is looking older than it should, a lil Botox never hurt anyone. I’d say a majority of my patients are in the 20-45 year old age range. It’s becoming more acceptable to openly talk about doing Botox amongst younger people. (Although there’s always that one person who has to put their negative opinion in the mix when it comes up. THEY would NEVER do it. Yea… I’ll see them in five years, when all their friends are doing it!). No one ever regrets having kids, getting divorced, or doing Botox. 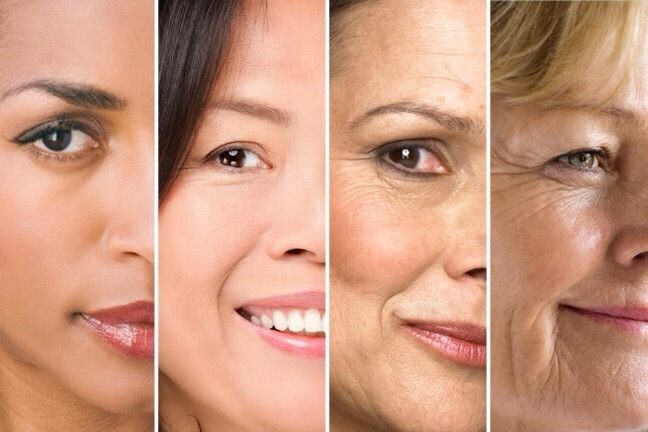 Wrinkles and sun spots aren’t the only things we can expect to happen to our face as we age. There are many structural changes going on below the skins surface that contribute to an aging face that most people would never have noticed when they look in the mirror. The young face on the left is round, contoured at the cheeks, and has a sharp jaw line (oh and hair and no wrinkles). The face on the right appears narrower, sunken, and droopy. So besides the integrity of your skin, what else has changed? Let’s start at the ground level. Your bones. Your bones are always being built up and broken down. The rate at which the bone is broken down slowly starts to exceed the rate at which the bone is being built up as you age. Injury and periodontal diseases result in loss of teeth, and it’s not like when you were young and the tooth fairy came and left you a dollar and a new tooth grew in (I hear with inflation it’s like $5 now!). Loosing teeth affects the jaw bone and the muscles which attach to the jaw bone, which can result in make the face look narrower, hollow, and concave on profile. Taking care of your teeth is super important, and not just for that pretty smile! Collapsing fat compartments in the cheeks and temples reduce support to the overlying skin (side note: don’t worry! These fat cells go to other places… like your hips! j/k). Most people miss this when they look into the mirror at their aging face, but loss of fat in the temples results in the phenomenon I like to call “peanut head, ” which is also noticeable on super athletic people. The presence of peanut head reflects a lack of support of the outer brow, which, along with loss of subcutaneous fat in the upper lid, causes the appearance of a droopy upper brow. Eye sockets become wider and longer, resulting in a bulge of the cushiony fat pad that lies underneath the eye. The cheeks start to flatten out, and the fat from the cheek descends to create a deep nasolabial fold. The tear trough (area where eye skin and cheek skin meet) becomes noticeable. The middle third no longer has that fluid contour. This loss of fullness and form change causes shadowing in the trough, making a person appear to have dark circles, resulting in a tired appearance (just one of the things that causes dark circles). Angles of the nose change, giving the appearance of increased length and the tip of the nose begins to droop. Decrease of collagen and increase in tooth display at rest cause the upper lip to lengthen. Fun Fact: the upper lip can stretch by almost 4mm as you age. 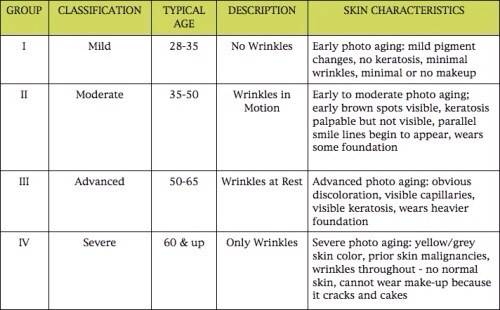 (Stolen from another site…shhhh…) Image A shows a youthful face. Look at the contouring from the eye to the cheek. As you age, it can be convex like image B, which shows the fat pad bulging, or it can be concave like image C, making the eyes look hollow. Both B and C show a flat cheek when compared to Image A. With all this stuff happening in the upper portions of the face, skin sags and starts to hang in the lower third. Adding insult to injury, the angle of the jaw changes, the jaw line, becomes less defined, and the chin shortens. Excess skin droops from the jaw line from gravity and loss of elasticity. Loss of ligament support in the jaw leads to the formation of jowls. Even with droopy skin, the lower portion of the face starts to look smaller than the upper and middle third. (This image was also stolen). Don’t worry. There are things you can do for volume loss! They do NOT include Oil of Olay, although the new commercial on tv claims it can (they lie). For advanced volume loss, Sculptra is really the best injectable product. This product is a biostimulator; it works by stimulating your body’s own natural collagen. Results are the most natural of all the fillers, and the product lasts 2 years. I plan on writing a lot more about Sculptra, so stay tuned! If you aren’t mentally or financially ready to jump into Sculptra, Radiesse is a wonderful thick, volumizing filler. It is usually my product of choice for cheek augmentation, naso-labial folds, and marionette lines. For tear troughs, I LOVE Belotero (which is made by the same company as Radiesse). Filling this area literally takes ten years off your face, but remember, it is a very advanced procedure. Stick to a friend’s referral as to who to go to; I have seen a lot of over treated troughs! For more help with fillers, check out What Goes Where?. Another option is fat transfer. I have assisted in several fat transfers; it is a very interesting procedure. If you are planning on liposuction, I highly suggest inquiring about fat transfer as well. For sagging skin around the neck and jaw line, surgery is the only real option to date. This being my area of expertise, it’s hard to know where to start, but first and foremost, I consider myself a bio-dork, so I’ll start there! The biological purpose of reproduction creates attraction to a youthful appearance by both men and women. Researches have found the female perception of beauty changes throughout the month (just like us woman to change our minds!). Women typically prefer a mature, masculine looking man. These characteristics include a heart-shaped face and small chin with full lips. During menstruation, however, woman are typically more attracted to softer, more youthful features. These include a small nose, large eyes, and defined cheekbones (which males find to be attractive characteristics for females). Thanks to medical advancements, we’re living years longer, and thanks to the economy, we now have to work during those extra years! The lines on our faces reflect the years of hard work, dedication, and stress from work and life in general. And let’s face it, the depth of the lines are in direct proportion the difficulty of life experiences. Although not technically visible, these experiences have a direct effect on our psychological traits as well. Therefore, one could make the jump that an older appearance on the outside reflects negative traits on the inside (I’m not saying it’s right or it makes sense). Yes, it is our culture to jump to conclusions from physical characteristics to psychological traits, making personal beauty to many a reflection of how they feel on the inside. Yes, life makes us feel tired sometimes, but it’s also full of exciting events! Graduations, marriages, reunions, divorce (hey, for some people it’s a good thing! ), children, grandchildren! All these things make us happy; they spark that joy we associate with being young and excited. Is it wrong to want your face to reflect this youthful joy?